The Helium alloy has been the best selling Miata Wheels for many years and the reason is easy to see: a classic design that looks great on a Miata and a very light weight for the price, just 11.4 pounds! Same offset as the factory uses for all 15 inch Miata wheels, 40mm. 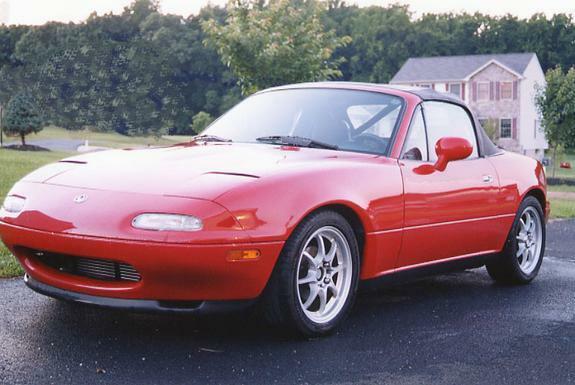 These are our favorite street Miata wheels in terms of lightness for the price (for track and autocross Miata wheels please look to our many 15x7 and wider). Clear coat over powder coat. YES, this wheel fits ALL years and packages of Miata from 1990 through 2005. Takes a standard 73/54 hubcentric ring also available on this website. Stock lugs are a tight fit, we strongly recommend a narrow extended length lug such as our spline drive lugs. See our wheel gallery in our forum for FULL SIZE pictures of these miata wheels on a Miata like yours.